Algeria Internet and Facebook Not Shut Down ! When the Egyptian government decided to flip the switch on its country's Internet on Jan. 27, news of the unprecedented shut down spread rapidly. Rumors that the same thing has happened today in Algeria are unfounded, even though the country has been on the radar for a possible "domino effect" of events in Tunisia and Egypt. Internet intelligence authority Renesys, which confirmed the Egypt outage weeks ago, says in a new blog post that it has no evidence that Algeria's Internet has been shut down. Algeria typically has about 135 routed network prefixes in the global routing table, and our data show that they are all still routed and relatively stable. Traceroutes inbound confirm that sites hosted in these prefixes are still alive, and spot checks of websites hosted in Algeria show that most are up and functioning normally. It's possible, that there are some Internet blocks not visible to outside the country, similar to Iranian-style throttling, but that can not be confirmed at this time. 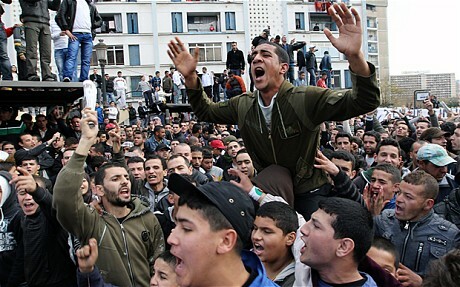 The Telegraph first reported that Algeria shut down the Internet and Facebook today in response to mounting protests. Social media website Mashable also picked up the report and led with it on its front page Saturday evening. The Telegraph article wrote, "Internet providers were shut down and Facebook accounts deleted across Algeria on Saturday as thousands of pro-democracy demonstrators were arrested in violent street demonstrations."